Oops - we don't appear to have a video for the PDS-6000F. At up to 160ipm (images per minute) 2-sided scanning and supported by a 100 sheet ADF (Automatic Document Feeder) and fixed flatbed, the PDS-6000F is capable of handling high scan volumes for businesses digitally converting on a regular basis. Expert paper handling with the Ultrasonic Multifeed Detection and Reverse Roller technology reduces the risk of damaged documents, offering outstanding reliability when batch scanning a variety of document types and weights. Our PDS models can handle a range of media capacities up to embossed plastic card, addressing all user and departmental needs. 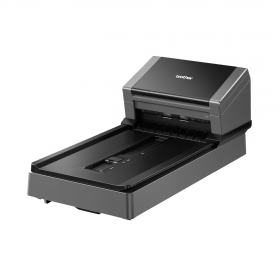 As well as paper handling upgrades the PDS-6000F has enhanced image processing features such as prepare and clean ensure improved scanned image quality for storing, editing and sharing. Business critical documents retain their original appearance, giving businesses a professional edge when printing or viewing scans with customers, or when storing for disaster recovery. The addition of a fixed flatbed scanning platform means that even fragile and various sized documents such as passports, magazines and certificates can be reliably scanned with ease. Ideal for businesses and small corporates with a regular or batch scan requirement.